The flyer with this CD says that ‘one has to look very hard to find any sound carrier bearing music from Zambia,’ and my shelves only carry a couple of CDs, and three and a bit LPs. Their content is either the music of acoustic guitarists, making the transition from tribal to industrial life in the fifties, or kalindula, the modern Congo-influenced guitar band music. 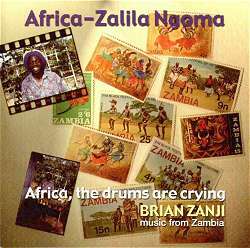 Brian Zanji is described by the press release as both ‘the most notable traditional musician in Lusaka,’ and virtually the only one, and he and his ensemble (three men, one woman) seem to be ploughing a lonely furrow. Zanji plays thumb piano, marimba and drums, and his accompanists various drums and percussion, and they perform songs that are either traditional, or composed within traditional idioms. On this disc, Zanji sings in Luchazi, Tumbuka, Bemba and English as well as his native Nyanja; the final track, which features all the languages mentioned, is both a call for decent behaviour to the afflicted, and a demonstration of how the message would be sung in different parts of the country. Zanji seems to have mastered the various tribal idioms successfully, without trying to acculturate them to each other. Otherwise, though, it’s hard to comment, other than on the impact of the performances as sonic landscapes. Most of them are very enjoyable, notably the charming Piki Piki, a counting song in Bemba (but with the numbers in English), which has a very pretty texture, arising from the interplay of twanging kalimba, mellow marimba, and an unpredictable (to these ears, anyway) hand drum pulse. (sound clip) It’s followed by the very different Kalyaba, a driving harvest dance of the Tonga people from the south of the country, played on drums and a scraper of some kind. (sound clip) There are occasional longueurs; Mama Africa is not much more than a telephone directory of African leaders, accompanied by kalimba figures that sound like a musical box. As such, it manages to be twee and dull at the same time. (It also reminds at least one British listener of ‘Mr Everything Comes From India’ in Goodness Gracious Me - but that’s not Brian Zanji’s fault!) Tulembeza (Put the Basket Down) is another uninvolving track, on which Zanji translates the lyrics into English between the verses. The result is to disrupt the flow of the performance, and to annoy the listener, who wants to know why the two women villains of the piece decide to kill a blind woman’s newborn baby. Those reservations apart, Africa-Zalila Ngoma is a likable CD, well recorded and well played. Valuable as documentation of a number of little recorded, but evidently vibrant, musical traditions, it is also valuable simply for the enjoyable diversity of its contents.